Details on how to enter to win a copy of Burn Bright at the end of this review along with a link to purchase the book from Amazon and from an indie bookstore where a portion goes to help support KRL. Charles and Anna are taking care of the Marrok’s werewolf pack while the Marrok is out of the country. The Marrok is The Alpha of all the werewolf packs in North America. Close to the pack, yet not included in it, are the Wildings. Charles and Anna get a call that there is trouble from the mate of one the Wildings, and they race to help. But the problem ends up being more complex than expected, there is a traitor in the pack. Charles, Anna, and Leah decide they need to get word to other Wildings to look out for trouble. I enjoy the stories about Charles and Anna, and I like how Anna is growing more confident and secure in her position as Omega. Charles would love to just wrap her up and keep her safe, but he has to let her learn and grow. They are also continuing to grow as a mated pair. This book was different in that for the first time Leah, the Marrok’s mate, was shown to have a couple of good traits. I found the ending amusing because Charles had to be rescued, and by whom is the funniest part. I really liked this book. I enjoy Patricia Briggs writing and her world building. She has been building more mystery into the books recently, and pulling surprises that leave you going…”WHAT?” This book did leave me with a couple of questions that I wonder if Patricia will end up answering in future books. But this book could be showing us where she will be going in the future. Unless her muse takes us down another path. To enter to win a copy of Burn Bright, simply email KRL at krlcontests@gmail[dot]com by replacing the [dot] with a period, and with the subject line “bright,” or comment on this article. A winner will be chosen May 23, 2018. U.S. residents only. If entering via email please include your mailing address, and if via comment please include your email address. Mary Anne Barker recently retired from the Reedley Library to look after her new granddaughter. She loves books, TV and movies. no web site or twitter account. 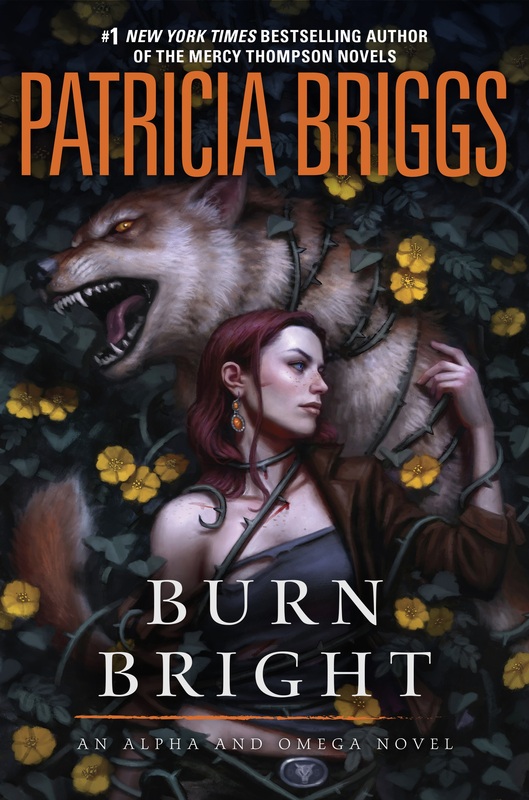 Patricia Briggs is one of my favorite authors. I loved the Mercy Thompson series but haven’t read any Alpha and Omega stories yet. Great review! It’s so much fun to switch between this series and Mercy’s, I can never choose one as my overall favorite. thanks! Typed in correct email for first post. I enjoy reading Patricia Briggs books. leilani1308@yahoo.com thank you for the chance!! I loved this book and I loved that all of the side characters are as well developed as the main characters! I would read a book series about most of the side characters but would love to see Asil get his own story line. Lately I read the newest book then reread the whole series back to bak. Love Patricia Briggs! She is one of. my favorite authors. I would love to win this book.